A Chinese capsule with three astronauts aboard has parachuted back to Earth after a successful space module mission. 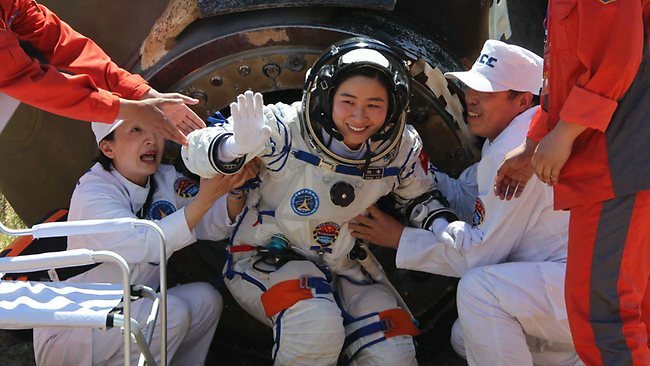 Liu Yang, the country’s first female in space, was part of the crew. “Their spacecraft, the Shenzhou 9, parachuted to a landing on the grasslands of the Inner Mongolia region around 10 a.m.” The NYT reported. The astronauts Jing Haipeng, Liu Wang and Liu Yang, above, China’s first woman in space were the part of the mission. This is a big achievement for China that wants to have a permanent manned Space Station. What did they bring back from space? They did not bring back anything. The mission was to stay in a temporary space station. In future there will be a permanent space station, and this was the first step towards that.